5 reasons to use Wallpaper -It’s right up there. Wallpaper going up the wall is just the thing for so many reasons. We are using it a lot in projects at the moment, and when carefully thought about it really can add the energy and vibe that is often missing in an interior. Here are the first 5 reasons to use wallpaper – there are many, many more. 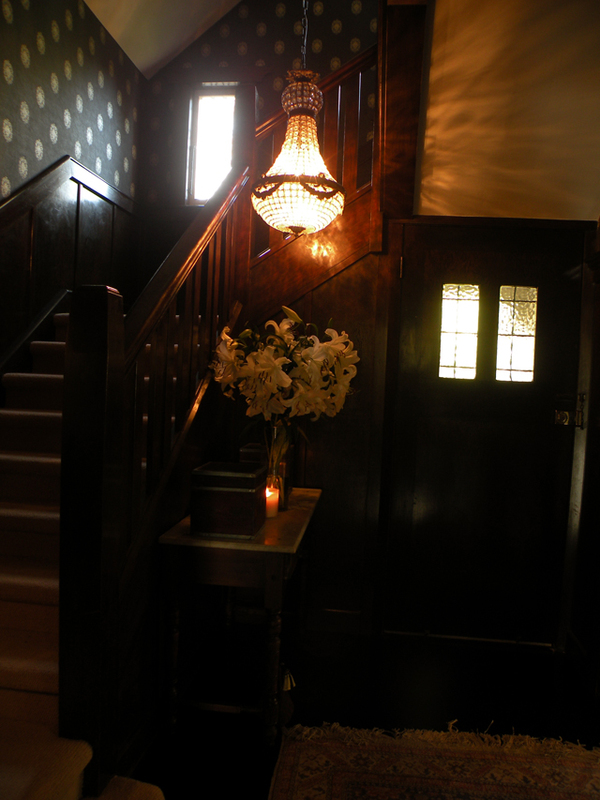 In an otherwise uninteresting hallway it is a great way to add charm and introduce the ‘theme and style’ of a house. It creates a welcoming visual treat. Used in other rooms it can be used to relate back to a theme, relate to the area the house is in or to create an ambiance. 2. Wallpaper to add light. This could sound crazy but if you have a room where there is very little light getting in considering using a wallpaper which has a metallic sheen to it. It will help bounce light back into the room. It works because it diverts the eye away from it not having a lot of natural light. 3. Wallpaper helps in the dark. True. A room painted or wallpapered in a dark colour does the same as above, and diverts the eye from thinking it is a small dark horrible space. It lifts the whole space to another level and makes it seem sooooo much more interesting and dynamic. These ideas do work as it is all about tricking the eye that there is light or it is not so dark. This is because Wallpaper diverts the attention away from the negative aspects of the room. 4. Wallpaper adds warmth and charm. In the pictures below, this room was not being used by the client at all. It was cold and uninviting. We used a warm coloured wallpaper to add an interesting layer to the room, create depth and personality. It now feels warm and cosy and is helped by the unexpected punches of colour that we reupholstered the clients antique sofa in. The room is now used and the clients love it. We used this wallpaper to tie back to the paper that was used in the hallway. Using the same colours provided a link to each space and tied the room and hallway together. This gives unity and flow to the house. 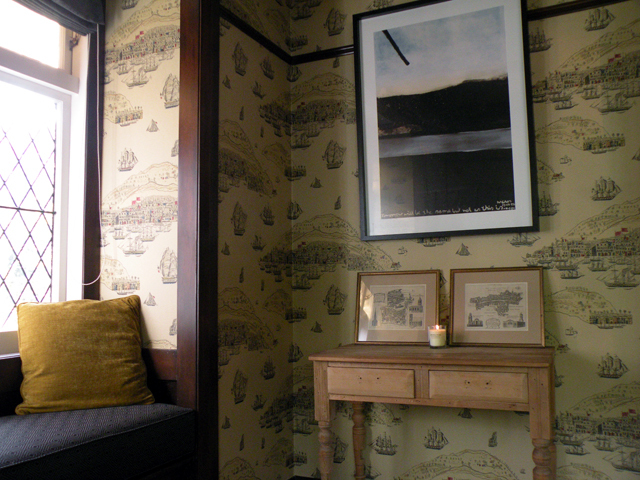 The wallpaper in this room was inspired by some old treasured maps of London. We chose Trade Routes by Zoffany has a similar look and feel to it as the prints. Wallpaper inspiration came from the prints on the table. 5. Use Wallpaper as a feature. 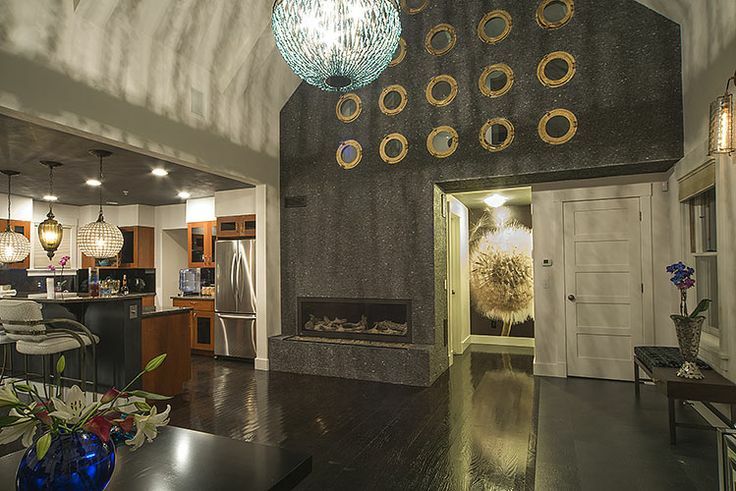 Remember feature walls? Well, don’t paint them, it is much more interesting to wallpaper. By doing so you add another layer and character to a room. So, is something missing in your space? 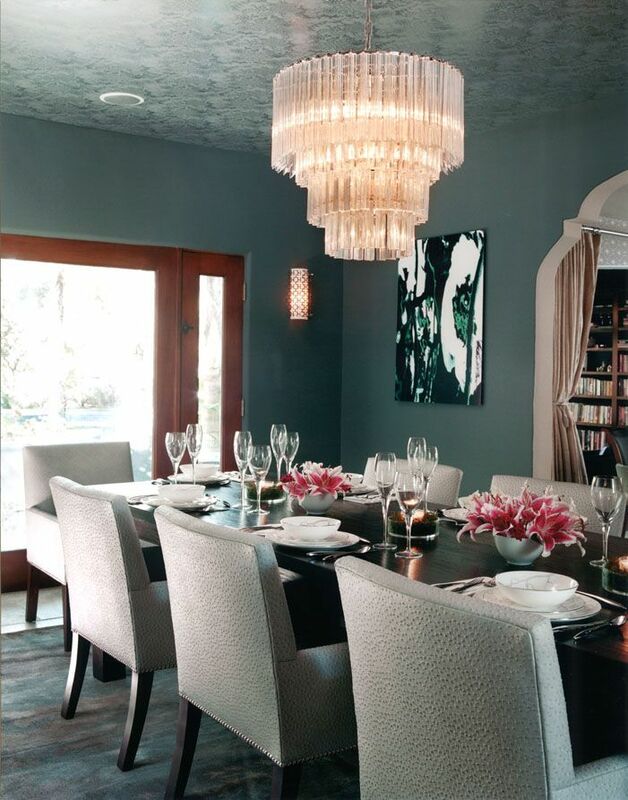 Consider using a textured paper especially if the room is neutral. Texture is so often overlooked. It doesn’t have to be full on floral, but be brave and use it to tie back to your colour scheme. I promise, it will look truly amazing. 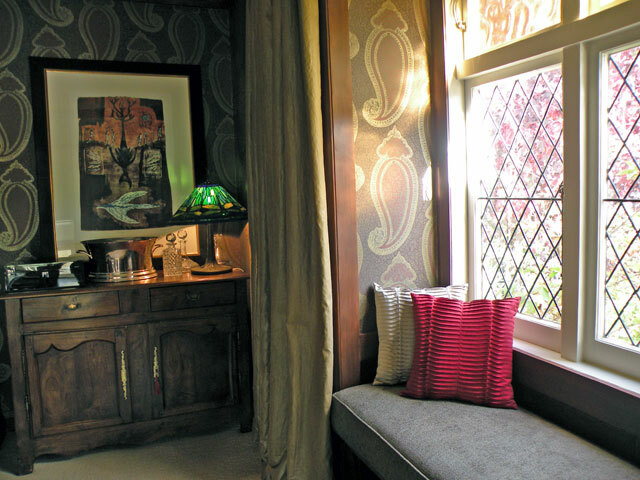 Wallpaper adds character and defines the desk area in the corner of a lounge. 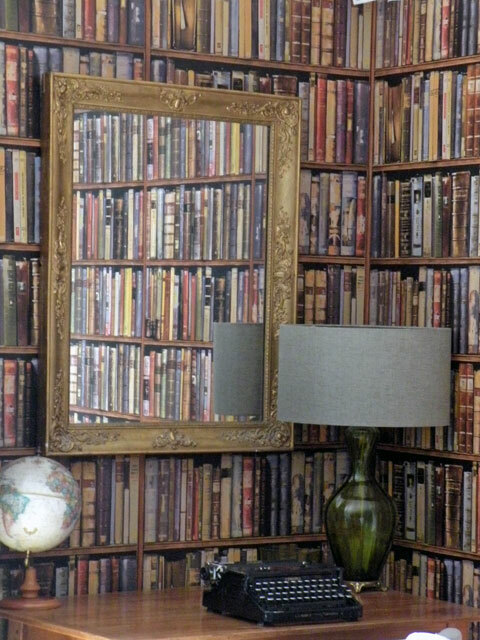 So think about using Wallpaper in your favourite or not so favourite space- it’s right up there! If you’d like help choosing the right wallpaper in the right place we’d love to help. 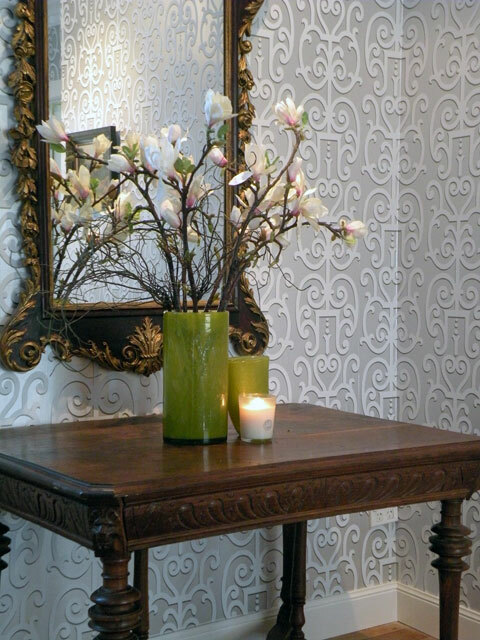 Check out our Wallpaper inspiration on our Pinterest page. This all may sound like Buddhist Friday talk, but a lot of an Interior Designer’s work is simply this. Changing things around as things change in people’s lives. And it is not all about going out and buying everything shiny and new. Not many of us can afford to do that, and frankly a lot of these rooms will be characterless with no soul. So, have a look around your space, make a plan with possibilities, and then move things around. Try a couple of chairs in a different room. Do they give a contrast in scale in height that was missing before? Move the sofas into another room. Do they look better there? These chairs add a contrast in scale and height in the room. Also add smooth with rough table. Via Greige Design. Ring the changes with a detail on a curtain panel, reinvent your side tables, put an extra desk in an unexpected place as a makeshift study. 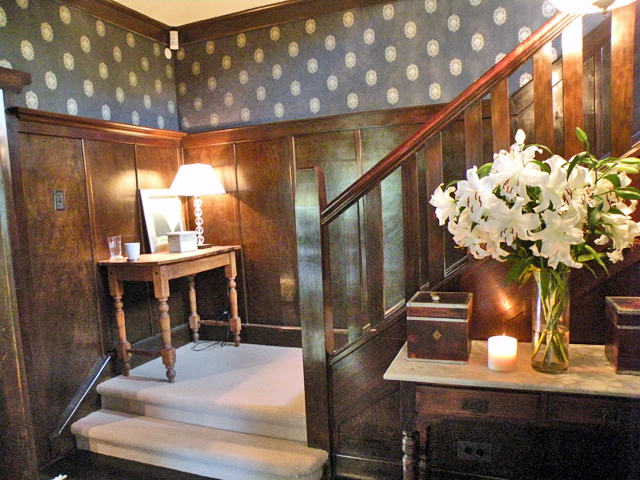 Make the hallway an interesting space with wallpaper and hang those family photos that are in a box in a cupboard somewhere. Maybe you could do something exciting with a dinner set that is lurking around at the back of the garage in a box. Use an old chest as a coffee table, recover a couple of chairs, use some fabric that pulls it all together with colour, pattern and style in cushions. Have a look at those table arrangements – tablecapes – re-arrange and re- do them. Re-fresh, re-new, re-jig, re colour. And some people call it redecorating and redesigning. Textural contrast on a table top. 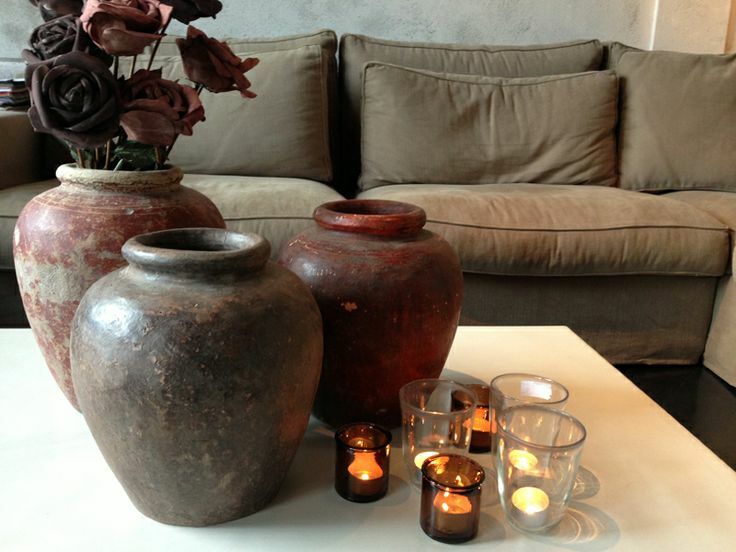 Add candles and shiny glass to terracotta pots. Via Molitli Interiers. If you would like help with redecorating or re-jigging your interiors due to changes in your life, do not hesitate to contact us. Have you too much space in a living room? Often spaces can be too big, as big as a barn,and the spaces just don’t seem to be intimate, warm and welcoming. This may seem surprising, but it is as common a problem as too little space and is actually a little more tricky to make work. Take some interest in the big public spaces around you – hotel lobbies and bistros – to get ideas. Notice how the different spaces work and how they have been linked together to make a cohesive whole. Is it tied together with colour, similar furniture styles? Is the flooring different? Note the layouts – you will see each has smaller zones for relaxing, dining, or conversation areas within the greater space. It still functions as a seamless, personal attractive whole, and your large living room can be similarly zoned. Furniture arranged in different areas fill this room & allow for various activities. Held together with similar colours in wall & floor coverings. Via Damask & Dentelle. To create a spacious feel, unify the room with colour, texture and light, to create harmony within the different areas. Texture is the best way to add personality and keep things welcoming. Using the same texture across the different zones and spaces will provide the glue that pulls the whole thing together. 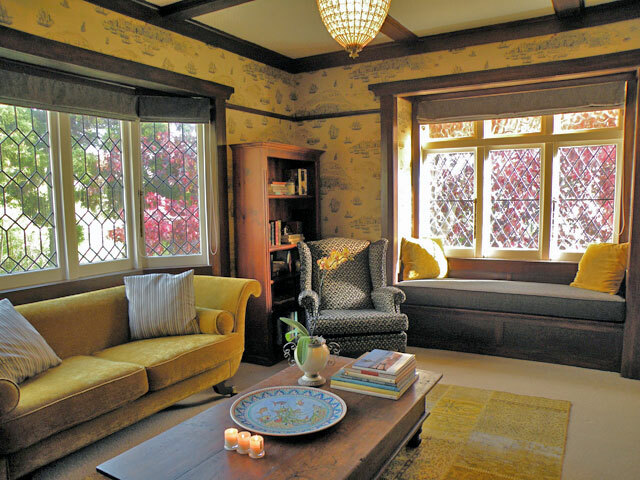 Several seating areas have been created using different pieces in this fabulous room. All held together with colour and pattern. Keep furniture arrangements simple and easy to reconfigure for gatherings in different ways. Buy more versatile pieces that can be used in different ways. Having a focal point – a large one such as a chimney surround or a rustic armoire for example will brings warmth, texture and personal interest into a room and will anchor down the different areas/zones. 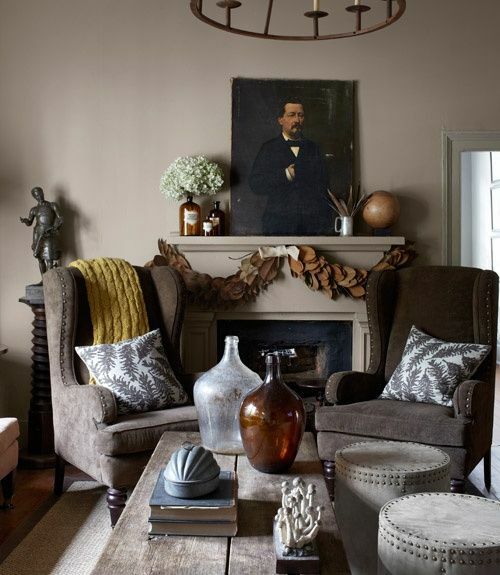 Get the bigger pieces such as sofas off the wall (have said this before) and then place a desk or even smaller chairs behind a sofa with a table in between so that you immediately create another area.Thinking creatively about furnishings and re-inventing pieces will make the room even more interesting. By keeping the chairs and tables simple and not too heavy looking-be sure you can see underneath them as this creates the illusion of space- they can be easily moved around to suit visitor numbers as and when required. Note how the colours and tones are similar throughout. 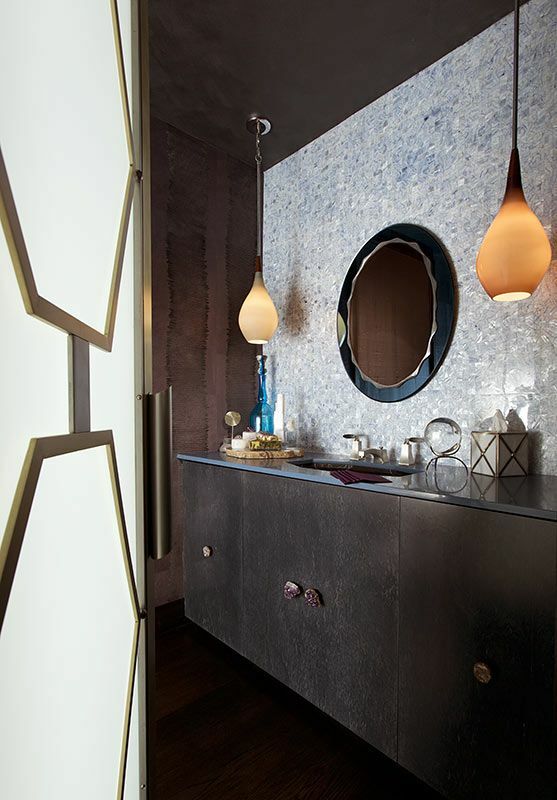 Textural interest and lighting help to anchor the scheme as does the contrast in scale and height of the furniture. Built in seating is a good way to add interest and another seating zone in a room. If you would like help with your large room layout please contact us. We also visited Sarsfield Brooke furniture showroom today, with lots of new furniture to get creative with. Available through Interior Designers nationwide. This dressing table once belonged to the client’s grandmother, and has been reinvented as a bedside table. By reinventing side tables you can add the unexpected and put your own personal stamp on a room. Forget about matching pairs, think beyond boring and ordinary. Really all you need is a flat surface next to your sofa, armchair or bed that is about 600mm off the floor- correct? Would a milk pail (milk gone, turned upside down! ), a rustic wooden chest, or a trunk that was left to you by your Great Aunt Edith, do the trick? Have a go as these ideas will all add interest and an unexpected touch to your room. Plus it will make it individually yours – no store bought things here! Add your own interesting combination of lamps, drinks, books and you will not only bring new life to an older piece and your room, but you will preserve your chosen ‘table’ at the same time. A small table reinvented as a bedside table, carries on the nautical theme of a child’s bedroom. A cane chest reinvented as a bedside table, adds texture, provides a landing surface for accessories, and has much needed storage within. A vintage table painted and then topped with a mirror to spruce it up, adds glamour and texture as well as surface reflection. For help with reinventing side tables feel free to get in touch with Room Service Interiors. Hallo everyone, sorry it has taken me so long to get back to writing, though there are still lots of subjects/posts to share so here we go! Today’s post was inspired by a chat on the beach with a lady who was planning to build a new beach house and have it done by Christmas this year. She was serious. Assuming she had plans already under way it was disconcerting to find out she hadn’t even had the concept plans drawn up yet by an architect. Hmmm. Yes it still would be possible if she was planning on a kit set, pre fabricated type of building. However she wasn’t. Getting plans done for a house takes time – it is a little like slow cooking, for a project to be successful and completed on time it needs to have had careful thought and preparation about needs and wants. Make a basic plan with your wishes and then cut it back budget wise to fit your project. It will take careful consideration and several visits to your architect to get it right, and it does take time, not to mention money. After that there is the challenge of getting the plans through council, which is never an easy or quick process. During the time spent working with architect and council you should also be looking at styles, finding out about builders, project managers, or any interior designers you want to work with. Collect together or make a scrapbook of pages of interiors/exteriors of houses that you like in order to convey to everyone who will be involved with your project what you want and like. It is a really useful tool for yourself to narrow down what you like. House plans are the most important part of building, so you need to consider the location, lifestyle, family size, environment and budget as well as spatial, future requirements, building materials, aesthetics and local and government laws. Little details can be added later once the house layout has been done. Get yourself a professional and recommended architect who has the knowledge and expertise to outline those things you want. Once you have the plans in place the details of style, colours, etc can be done. Pinterest and Houzz are useful places to search for ideas. So, be prepared to be patient and keep pushing ahead. Be sure to include everything you will need now and in the years to come in . You’re the project driver but be realistic about your time line. Trying to reach an unrealistic deadline will make for a stressful lead up to Christmas this year for all involved. (And a big disapointment when you are camping on a building site!) So start the planning now for Christmas 2015 is being more realistic about the outcome. With time, lots of thought in your favourite swing chair, looking at your fabulous beach view, your plans will come to fruition and your holiday home project will be a success. If you would like help with your holiday home, we’d be delighted if you contact us.